Good health begins with a personal commitment to leading a wholesome and healthy lifestyle. 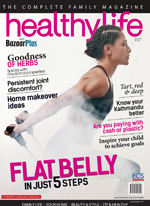 healthylife monthly, a completely family magazine,is targeted at the modern homemaker with stories on fitness, beauty, food, nutrition, relationship, parenting, health products, decor and more. If you need to make smart choices helps the homemaker in you make smart and informed decisions for your home and your family. Promote total wellbeing of individuals, households and the society. Enable the homemaker to make informed choices. Provide updated information on current health and welbeing trends. Updates on latest health products and services.